In Part 1 of Genealogy Games for a Family Reunion I talked a bit about one of the genealogy-based events I'm setting up for our Amazing Genealogy Race. Today I want to talk about how race teams are chosen. 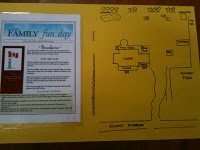 Our Family Fun Day (that's what we call it) should see about 35 people here. There will be 9 children under the age of 12. Because we are on a farm property we don't want children going around on their own so all children under 12 have to be with an adult. First I made a poster explaining the rules of the race and more importantly, the boundaries. Every year something unpleasant happens. One year my niece broke her ankle while participating in the Scavenger Hunt. Last year several people were stung by bees when they ventured too near one of our outlying barns. So this year I've reduced the boundaries to the cleared property around our house. 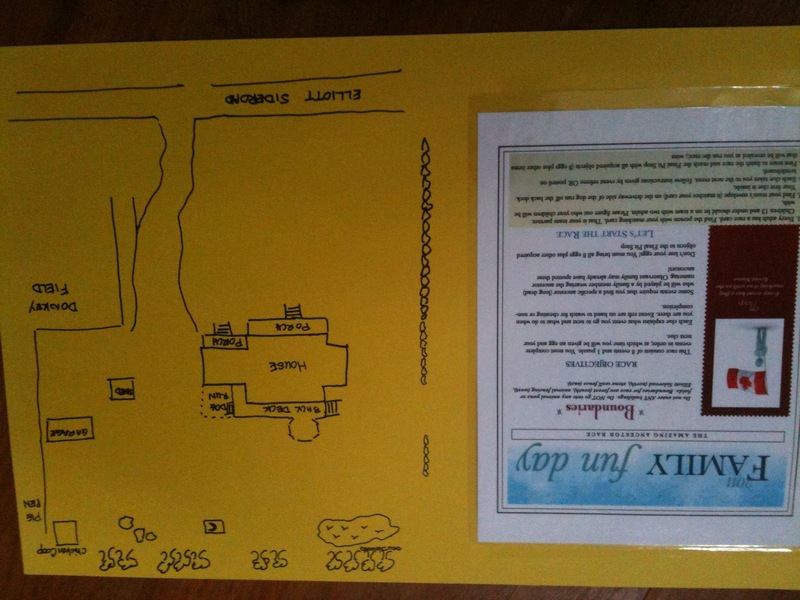 I've drawn a very loose representation of the boundary area and explained it on the RULES poster. Why a poster? Because no one listens to me when I try to explain the rules just before they start the game! My family apparently has a short attention span. Or I'm boring. Either way, they just mill about and chat and cat-call while I'm attempting to explain how to play the game. Teams for the Amazing Genealogy Race consist of two adults (and as many of the under 12 years of age children they wish to have with them). I want people to mix and mingle because we have invited my family, hubs' family and assorted friends. Some have never met. So this year I've created Ancestor Cards. I made duplicate sets of the same ancestor with a photo, their name and brief biography on the card. 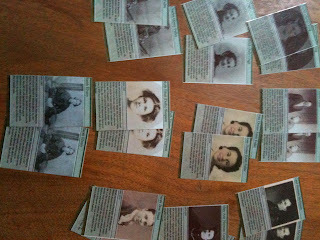 Hubs laminated them as I hope to use them in future genealogy games. There are matched sets and every adult will receive a card moments before the game begins. After all the ancestor cards are given out, each person has to find whoever holds their matching card and that is their 2-member team. As soon as they find their match they are free to begin the race. I'm really looking forward to them reading their ancestor bio and watching them race from person to person trying to find a match. I expect some of the more competitive younger family members to be yelling out ancestor names "Sarah Elvery Stead, I'm looking for Sarah Elvery Stead!!!" I can hear it all now and it makes me chuckle to think of it! Some years I have them choose a card (last year it was animals) when they first arrive so they can wander around for the first hour of the reunion looking for their matching card. But this year I want it to be a bit more chaotic. I also want to spread out the teams and not have everyone racing to Event #1 at the same time. The first event is a hunt for wampum in honour of our ancestor Cornelis Van Slyke, a Dutchman who lived in New York in the mid 1600s .... but I'm getting ahead of myself! I'll talk about that event in another blog post. I'm smiling about your family not listening to the instructions. How typical. How real. That's family!! This sounds like so much fun! We should do it here, minus the broken ankle and bee stings! Thanks for the laughs! I too can easily relate to family members not paying attention and then constantly asking "What", "Who", "How does it work". These contests sound great. Can't wait to read the rest and hear about the results...we have a reunion coming up next July! I may have to borrow some of your ideas friend. I can't wait to read more of your planned games. I hope you are going to video some of the afternoon. I just found a website where you can create trading cards. I was wondering if that is how you created yours?